Breast cancer is the most common type of cancer and also the deadliest, the World Health Organization estimated that by 2020 the cases of breast cancer will be so much higher and that one of every eight woman can be at risk of developing breast cancer. Many factors contribute to breast cancer such as genetics, diet and lifestyle however the real cause for breast cancer is not determined yet. There are many ways you can reduce your risk of breast cancer and they are mainly focused on applying a few changes to your lifestyle. Eating healthy foods, staying physically active, avoiding alcohol and smoking, maintaining ideal body weight and getting pregnant, making babies and breastfeeding them are all factors that help in reducing the risk of breast cancer. 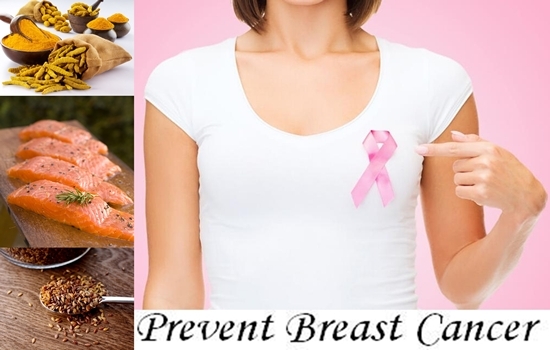 Certain types of foods are also able to reduce the risk of breast cancer if consumed regularly due to their ability to inhibit the growth of cancerous cells, a list of the most effective foods in this regard is put below so check it out. Curcumin which is found in turmeric is considered a natural cell protecting that is in addition to its anti-inflammatory and antioxidant properties, studies showed that it can greatly help in inhibiting the growth of cancerous cells in a variety of cancer types such as breast, gastrointestinal, lungs and skin cancer. Salmon and any other type of omega-3 rich foods can be great to reduce your risk of developing breast cancer and generally another type of cancer, the good fatty acids helps in reducing inflammation levels which is the root cause for many diseases including cancer, omega-3 fatty acids also help in preventing the growth and spread of cancerous tumors while boosting the immune system. Flaxseed contain a high levels of lignans which helps in protecting the body against estrogen-dependant cancers lime breast, Ovarian and Uterine Cancer, flaxseed oil is one of the few sources of the essential omega-3 fatty acids ALA which help in reducing the damage of inflammations that can lead to several types of cancer. Ten Ways To Get Rid Of Garlic Breath.